Soldiers enjoy getting mail from home while they are deployed. Military service members often leave their families and friends to go overseas and fight in wars or help protect other countries. While they are away, they often feel lonely. Some people enjoy becoming pen pals with military service members. This can be done by mail or through email. 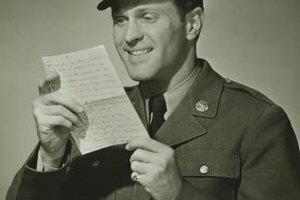 Finding a military service member with whom to exchange emails can be a little more difficult than finding a regular pen pal. For security reasons, you must go through specific organizations to acquire a military email pen pal. Ask around among your family, friends and coworkers. The easiest way to find a soldier to email is through someone you know. This way, you are also contacting someone who is close to someone you already know. Visit the United States Armed Forces News website (see Resources) to request the contact information for a soldier. Choose which branch of service you prefer and click on the link. This link will take you to instructions for finding an email pen pal in that branch of service. Visit milpals.com or Military Pen Pals (see Resources) to find links to various organizations that offer email pen pals in the military. Some organizations set you up with a specific soldier, while others are ways to send general messages that may be viewed by many soldiers. Post messages on the To Our Soldiers website (see Resources). This site does not get you an email pen pal but does allow you to leave general messages for all soldiers to read. United States Armed Forces News Service: Email Our Troops!